How did you get from the first part to the second part? If someone told me they wanted to resist the president's agenda, I wouldn't automatically assume they meant violent resistance. Good question, it should never be that way but that is the world we live in. When you have senior members of the DNC praising violent protesters, attacking federal agents for doing their jobs and encouraging "resistance" to attack workers, the party as a whole shares responsibility. Even the Nazis has good people as members but they were still Nazis. I grew up voting democrat but never again, I am pro military, pro law enforcement and anti thug. When the party swings back toward the center, I might return. Until then I will only support democrats in local elections, never national. 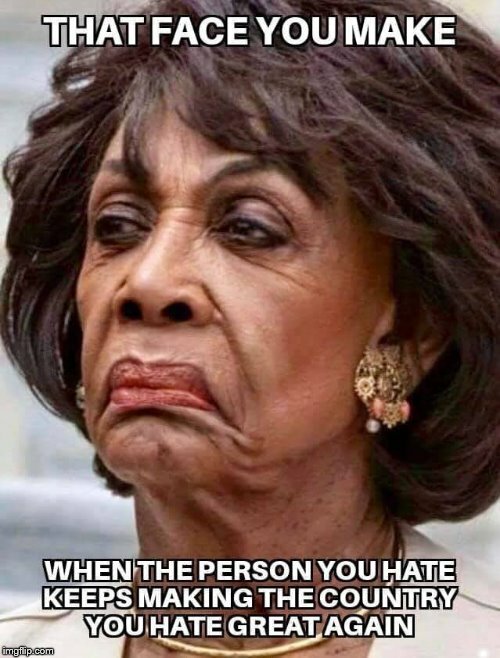 I will say that what Maxine Waters said about harassing Trump supporters was stupid. The problem is, she's not an anomaly. Typically when an establishment conservative politician (I'm not including Trump, because he's "not a politician". That's his selling point) says something that is too far, they will apologize or backtrack (I misspoke, I was speaking in hyperbole, I was high on Ambien, ect.). I'm not hearing any establishment democrats denouncing her statement or hearing her backtrack. They may not be backtracking from what they say, but that doesn't mean that when conservatives backtrack, they are being sincere, as opposed to only backtracking because of the negative consequences their statements brought upon themselves. It's like the old saying: you aren't saying you're sorry because you're sorry, you're saying you're sorry because you got caught. Even if you're not genuinely sorry, an apology is, at the very least, an acknowledgement that the behavior was wrong in the first place. But if it's a totally empty apology, what's the point? It sends a message to society about what is acceptable. Neither would have I, but I think its because thats what alot of people do sadly. Clearly, you have not been paying attention for the last two years. "If someone told me they wanted to resist the president's agenda, I wouldn't automatically assume they meant violent resistance." Thinking people rarely make those drastic jumps in logic. I'm pretty sure you would fall into the thinking camp. But an "emotional plea" based speech that encourages resistance in this particular climate, can be interpreted by a segment of the population (left or right) as a call to violent action, especially if they're already inclined that way to begin with. That's why it's incumbent on those with influential voices to recognize that their speech is powerful and can be used as a weapon. I'm reminded of Rowanda and how it fell apart so quickly after years of priming the populace toward hate and violence. It took very little to throw that country into turmoil and experience the death of millions. Violent rhetoric was the catalyst. "But an "emotional plea" based speech that encourages resistance in this particular climate, can be interpreted by a segment of the population (left or right) as a call to violent action..."
"noun vi·o·lence ?v?-l?n(t)s , ?v?-?- the use of physical force so as to injure, abuse, damage, or destroy"
What Maxine Waters did was call for people who hold positions counter to her to be assaulted. There is no room for interpretation - she did it. There is video evidence she did it. One need not strike another to be found guilty of the crime of assault. Assault is the mere threat of violence, backed with the reasonable ability to carry out the threat. Therefore, someone who approaches another while they are eating dinner and begins screaming at them is, in fact, guilty of the crime of assault. It is the threat of violence backed by a physical presence. That is what Maxine Waters did - encouraged the assault of those who disagree with one politically. There is no other way to interpret that, unless one is being dishonest. ... and that means you haven't been paying attention for the last two years. All of the political violence stemming from the 'resistance' has been from #Liberals. They aren't launching letter-writing campaigns - they are inflicting themselves on people who are eating and going to the houses of those they have targeted for God's sake. That is violence. Crack a dictionary sometime and learn the meaning of words before you emote. Jesus, I'm starting to repeat myself like you. Has there been violence from people on the left? Yes. I never denied that. What I said was that if someone told me they wanted to resist the president's agenda, I would not automatically assume they meant violent resistance. One has to be deaf, dumb, blind and stupid to make an assumption of peace, especially in light of the literal definition of the word 'violence' AND Maxine Waters urging violence being visited on those who disagree with her. You quoted the definition of violence in a comment to Pascalean, not me. I didn't even see your message to him until just now, because it wasn't directed to me. Yes, I can cite examples of peaceful resistance: voting politicians into office who would oppose Trump's agenda, calling your politician and urging them to oppose his agenda, sending emails asking your representative to oppose his agenda, etc etc. Not all opposition is violent. 4. You still cannot post even *ONE* article supporting your assertions. "Because I said so" is not proof, especially when it comes from a serial liar. That you did not post even one link to an article agreeing with you, well... that's totally on you, not me. It's obvious the entire world of evidence agrees with me, not you. You are a trying to advance an agenda, and you will use lies, deceptions, omissions and straw men to make it happen. "1. You ignore what doesn't support your argument"
If you're referring to what I said about Breitbart, that's not ignoring evidence that doesn't support my argument, it's laughing at you for considering them a reliable source. "2. Your reading comprehension is abysmal"
"3. Your pattern of lying continues"
"4. 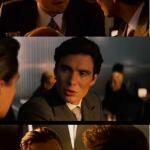 You still cannot post even *ONE* article supporting your assertions." I don't need an article to prove that there are ways to non-violently resist Trump's agenda. I clearly cited examples. Sounds like your reading comprehension leaves much to be desired.
" "Because I said so" is not proof,"
I never said it was. And I never said "because I said so". Misquoting me is dishonest in itself. "...especially when it comes from a serial liar." Which you still haven't backed up with proof. "It's obvious the entire world of evidence agrees with me, not you." "You are a trying to advance an agenda, and you will use lies, deceptions, omissions and straw men to make it happen." The media wants a civil war. I say we attack the media. Well if you wanna get technical, winning the majority of electoral votes is how you win the presidency. So what? I can have 50 more first downs in a football game and still lose. All that matters is the score at the end. If you want to get technical, claiming anything except the electoral collage matters is really, really stupid. Ross Perotisms are so 1992. If you want to get technical, Bernie would have easily won had the dems not stabbed him in the back. In the end, the world is better with Trump over Clinton. Her legacy will not be a good one. If they put half the effort into electing more Dems to Congress this year and finding an electable candidate for 2020 that they do with these stupid, self-defeating protests, there might actually be something to be concerned about. True but don't tell them, this is way to much fun. 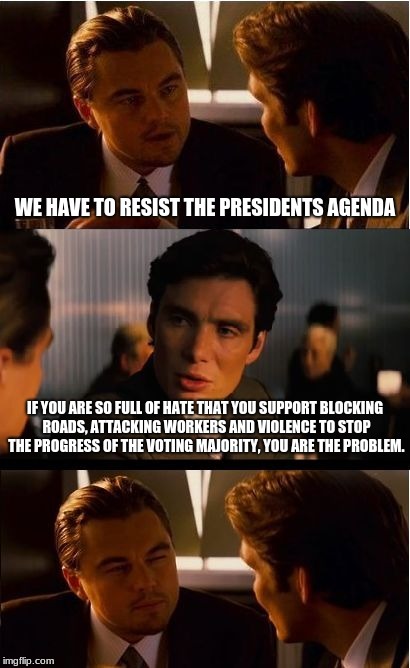 WE HAVE TO RESIST THE PRESIDENTS AGENDA; IF YOU ARE SO FULL OF HATE THAT YOU SUPPORT BLOCKING ROADS, ATTACKING WORKERS AND VIOLENCE TO STOP THE PROGRESS OF THE VOTING MAJORITY, YOU ARE THE PROBLEM.